Just north of Gothenburg lies what remains of Bohus Fästning, a fortress from the 14th century. Just saying that blows my mind because the oldest thing I know back home is Jamestown, founded 300 years later. I'm a sucker for stone ruins, and not just because they make for a nice backdrop. All that effort! And so long ago, before we had specialized equipment. The cobblestones are worn smooth, to the point of being slippery even when dry. I'm picturing carts with solid wooden wheels struggling up the steep hill. 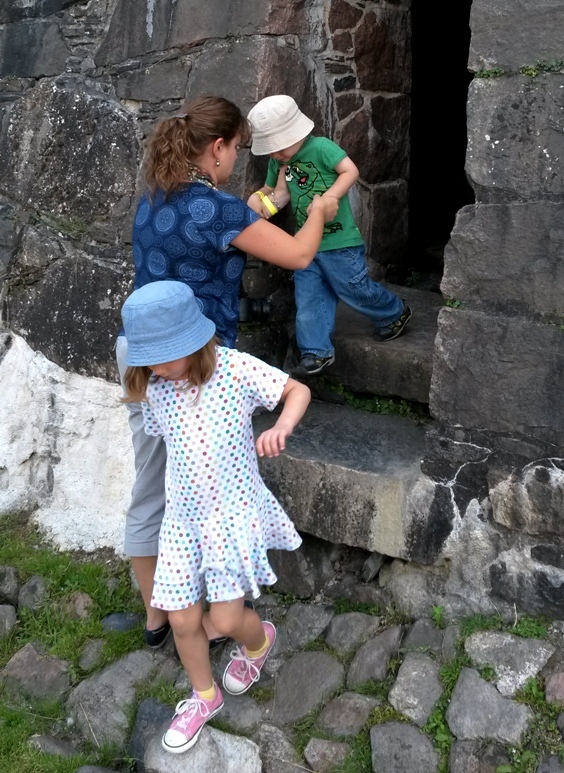 There were all kinds of little nooks and passageways to explore. Bowen kept asking if we could rescue Princess Fiona from the highest room in the tallest tower. The Shrek trilogy is the highlight of the kids' programming on Swedish Netflix. The fortress is in a strategic location, overlooking a fork in the Göta river. Sometimes I have to pinch myself! I love that places like this are all around us.